There are at least 190 monuments to Alexander Pushkin, the William Shakespeare of Russian literature, around the world. There are significant monuments paying tribute to other great Russian writers, from Tolstoy to Dostoevsky to Nabokov, and each has an unusual story behind it. 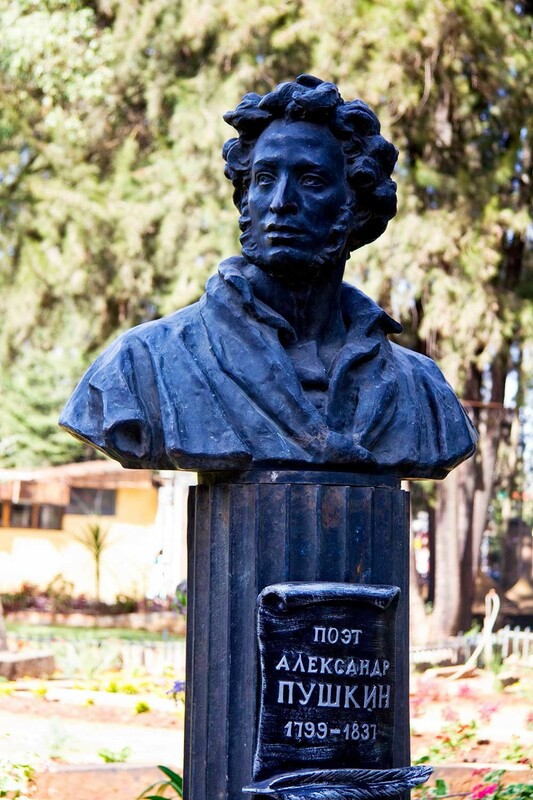 Among the most famous mementos to Alexander Pushkin is the monument in the city of Addis Ababa, Ethiopia, the likely birthplace of at least one of Pushkin’s ancestors. Historians believe that Abraham Hannibal, the Arab servant of Peter the Great, was kidnapped as a child, taken to the slave market, and finally brought to Russia. After becoming the czar’s subject, Hannibal was christened, and later became a general. It was his grandson who became the most famous Russian poet. 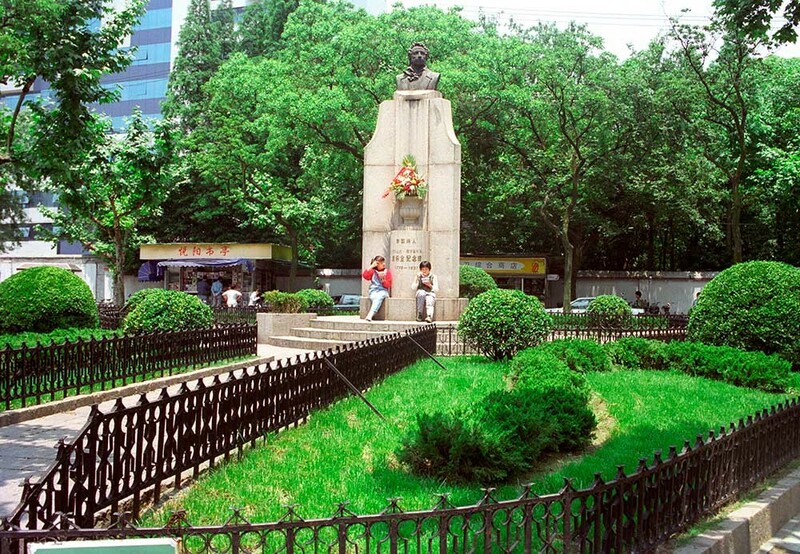 The monument to Pushkin in Shanghai, China, was first erected 77 years ago under difficult circumstances. Opera singer Fyodor Chaliapin helped raise funds for the statue when he toured China, as did the acclaimed cabaret singer Alexander Vertinsky, who lived there in 1937. Vertinsky had immigrated to the U.S. only to discover the poverty of the Great Depression; he then joined the Shanghai Russian community before moving back to Russia. The monument was torn down during the Japanese occupation of the city in 1941, only to be restored after the liberation of Shanghai and the end of World War II in 1945. There are 94 Pushkin monuments at home in Russia, and some of them are quite eccentric: An attractive monument to Pushkin and his wife Natalia Goncharova stands on the main street of Krasnoyarsk. However it is awkwardly engraved with a quote taken from the poem, "I remember a wonderful moment" – a verse dedicated to his mistress, Anna Kern. 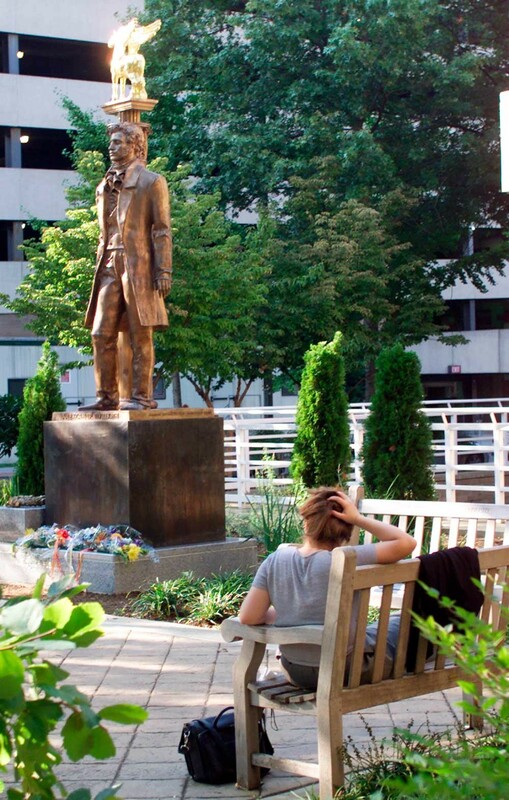 The famous Washington, D.C., monument to Pushkin is the first of its kind in the United States. The work was dedicated in 2000 with great fanfare and resides on the campus of George Washington University. The statue, constructed by Alexander Bourganov, was heralded as a sign of goodwill between the two countries two centuries after Pushkin’s birth. 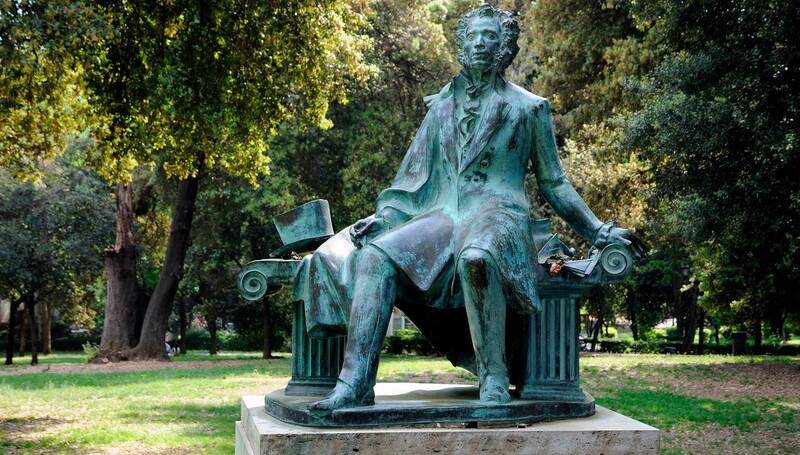 Monuments to Pushkin are located in Austria (1 monument), Belgium (1), Bosnia and Herzegovina (1), Germany (3) Greece (1), Egypt (1), India (1), Spain (1), Italy (1), Canada (2), China (2), Cuba (1), Mexico (1), Republic of Korea (1), Romania (1), Slovakia (1), United States (3), Turkey (1), France (1), Montenegro (1). 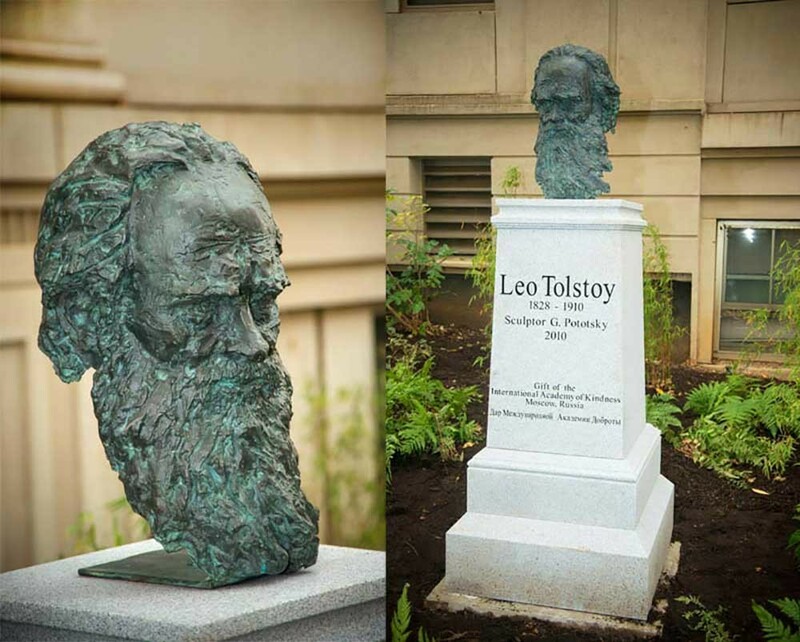 A monument to Leo Tolstoy in Washington, D.C. 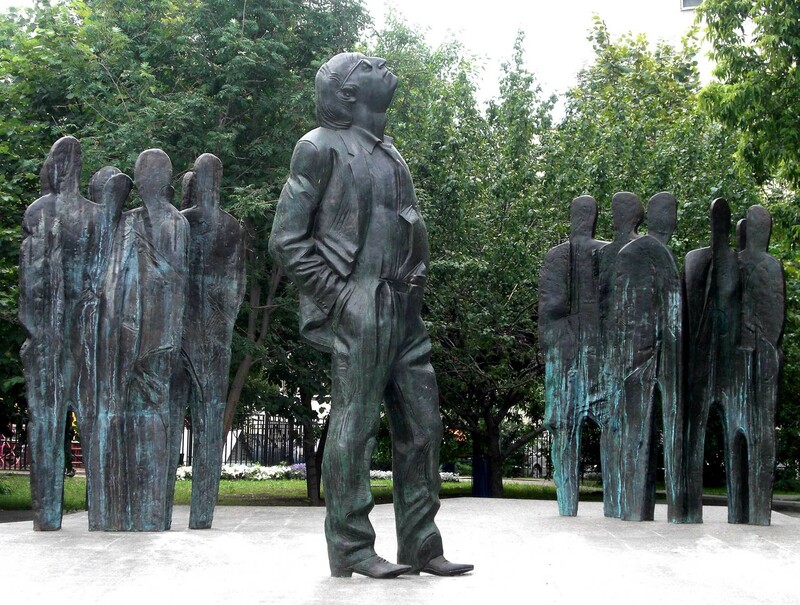 In 2011, a vast figure of poet Joseph Brodsky was erected in Moscow across from the U.S. Embassy. 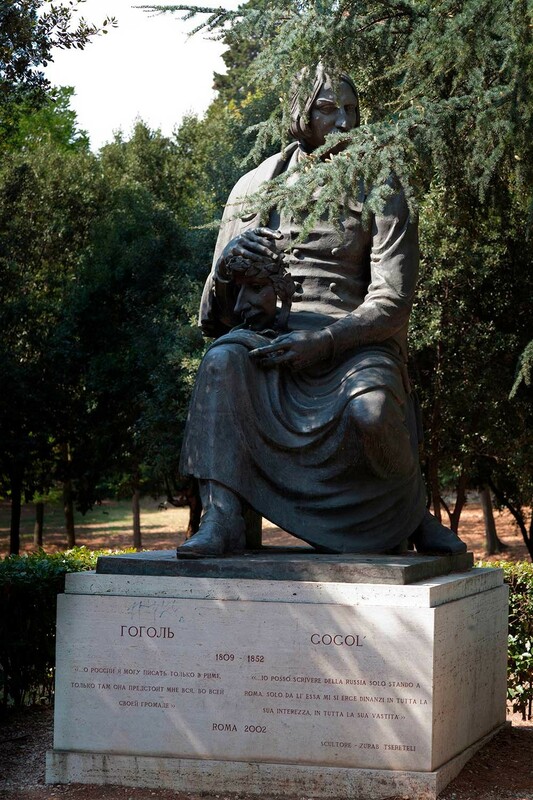 It was the city of Moscow administration’s idea that the statue should face the embassy grounds. 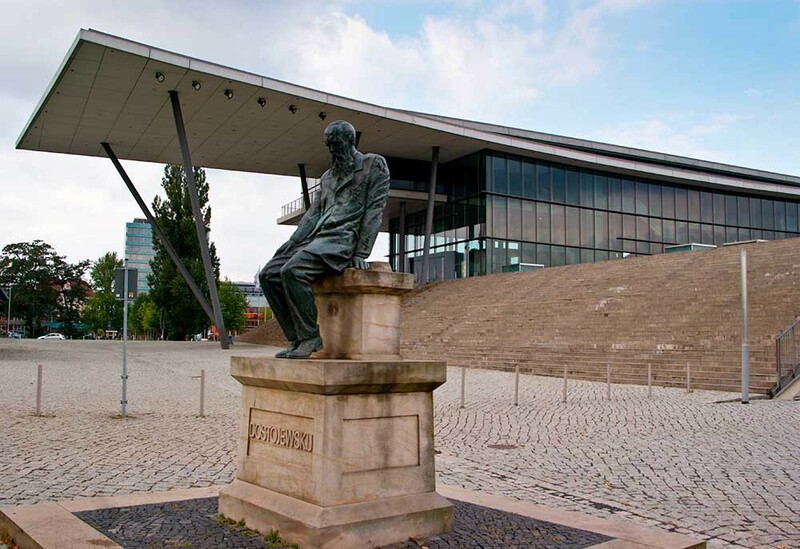 Fyodor Dostoevsky’s monument by Alexander Rukavishnikov was opened in 2006 in Dresden, a city the author often visited. He even lived there for a time, writing "The Eternal Husband" and "Demons." A monument to Anton Chekhov was erected the same year in Nice, France. The monument was donated by the International Academy of Kindness, Russian House in Nice and is located near the hotel "Oasis" where Chekhov lived. A monument to the writer Ivan Turgenev and the singer Pauline Viardot, symbolizing "the most perfect example of love in the 19th century" was erected in Buzhevale, France, in 2010. Vladimir Nabokov and his wife Vera spent 16 years in Le Montreux Palace. On the writer’s centenary in 1999, a monument by the sculptor Rukavishnikov appeared opposite the hotel.